Faulty elecrical motors operate intermittently, or not at all. It can be particularly frustrating if the components gradually slow down, stop functioning altogether, then suddenly start working again, only to fail again the very next day. There are a few simple fixes to eliminate this annoying cycle. By doing as many of these as you can, you will avoid having to dismantle and reassemble your motor over and over again, which is time-consuming and difficult to do. Check all connections using a multimeter. This helps you identify exactly where the problem might lie, and pushes you toward and appropriate solution. Re-wire the relevant unit so that it takes power directly from the battery. 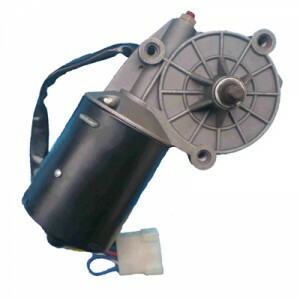 This eliminates the possibility that is your wiring circuitry at fault, and not themotor itself. Lubricate the components using electrical lubricant. This will require dismantlement if you want to be sure you have covered all the relevant parts of the motor. To take the motor apart you must first remove it from its housing by following car-specific instructions (check your car manual). Remove the circuit boards by lifting the side tabs with a small knife. Then pinch the small, black button tab in the centre of the circuit board and lift. You will then find that the board is soldered to the electric motor. Disconnect the joints by using your soldering iron. The circuit board will then lift out completely. Unfasten the four screws holding the gear cover in place. You will then see a yellow component (a gear). Mark its position and orientation clearly so you won’t forget how the two fit together during reconfiguration. Rectify corrosion in the system. Corroded contacts or wires will reduce the efficiency of a motor To remove corrosion, use a gel product such as Bilt Hamber’s Deox-Gel, these are designed for rust and corrosion removal. Because the smallest amount of this available is a 1KG measure of gel, you may also want to remove rust on other parts of the car, tools or machines. It is nontoxic, safe and biodegradable and it doesn’t destroy delicate steel wires. Install new brushes. Replacing worn brushes, if this is identified to be a potential reason for the part not working, should rectify the problem. Re-solder old joints within the motor. The area required can be located in the motor’s circuit board. Look for fractured joints, worn sections and corrosion. Use a hand-held household soldering iron to re-solder the joints. Allow them to cool before reinstating the motor. Repairing electical motors is a lot harder than you would expect it to be and obviously consumes quite a bit of time. If you don’t have the time to do this yourself or it has gone straight over your head, then please get into contact with us and we’ll solve the problem for you and at a low cost too!